Have your society members or library staff stopped, sat, and thought about how to engage children in family history? Genealogy societies and libraries are encouraged to find creative ways to engage youth so family history is passed down. If we do not engage the kids today, our genealogy societies are destined to close shop tomorrow because there will not be anyone to continue the work we started. There are many ways to engage today's youth in genealogy. Providing a kids workshop through your society or library is an interactive way to introduce family history to children. 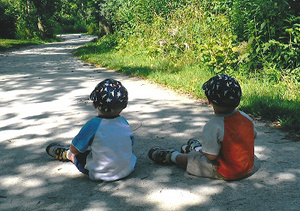 One of the first things to consider when planning a genealogical program is the age group of the kids you will teach. First through third grade students require very basic concepts and hands-on activities to drive the point home. For example, make your focus for this age group seeing the connections between family members. 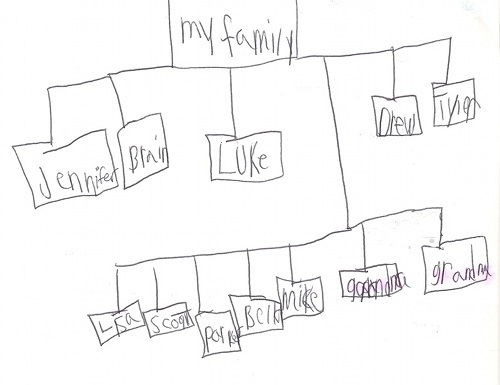 Using something other than a standard pedigree chart to help children see the basic family connections is a good idea. The image below was created by my son Tyler last year in first grade. His teacher explained the concept of a family tree by having the students write the names of their immediate family members on one line. Then draw a line down from that and write the names of the mother or father's immediate family. In this case, Tyler added my family and included his cousins. To this age group, a chart like this makes sense. The kids created another similar chart showing the other parent's side of the family. Older kids can handle more detail. Creating a standard pedigree chart and explaining how to use a family group sheet in greater detail is a good activity for older kids. The second thing to consider is the goal. Is this workshop an introduction to genealogy? Is it an intermediate or continuing workshop? An introduction to genealogy may be a short workshop that covers the basics of completing a pedigree chart, family group sheet, and an overview of possible records to use in research. An intermediate or continuing workshop should build on the basics and delve further into the record types, discuss interviewing, and have activities both during the workshop and for take-home. Are the kids Scout-type organization kids who are trying to earn a badge? What are the badge requirements? How are you able to help the kids complete some of the requirements? What information do they need to bring to the workshop? Where can you find more information about that particular badge so you can answer questions that arise during the workshop? No matter what type of workshop you create, always take the goal into account when planning time, activities, and handouts. The third thing to consider is what kind of take away you want to give them. Should they walk away with a firm understanding of how to get started or what is included in a specific record set? Should your handouts discuss only the workshop topics or should they also contain extra forms and resources? Should you give the children an assignment or project they complete at home just for fun? As an example, let's think about census records. The first through third grade take away is simply that these records show us where our families lived at a certain point in time. The children take a copy of a census record with them as an example. Older kids can go more in depth and look at additional details the census provides and what those details mean. The take away here could be for the kids to look at their own families and see what details they can pull from a census record. Think about what kind of take away you want each child to leave with at the end of the workshop. Start with an outline. The outline should cover the major topics you plan to cover in the workshop. Your basic outline for younger children may resemble the following example. This example could be expanded for older children to include additional topics such as home sources, interviewing, major record types, databases, and resources, depending on your goal. What is genealogy and why should I care? Should you believe everything you see and hear? From the outline, create speaking notes and a PowerPoint presentation. The presentation should include examples of various pedigree charts, family group sheets, photographs and records. Download pedigree charts and family group sheets. Both Archives.com and Ancestry.com have these and other forms available to download. When you present the material to children, tell stories with each record or photograph you display in your presentation. Stories will engage children quickly and keep them more focused on the task at hand. Engaging kids in genealogy requires creativity and the willingness to break things down into terms each age group can understand. What you present may not be the standard way adults learn the material and that is OK. What is important is that the children see the family connections. Ensure you have enough time to present the information and complete the activities you plan. If your workshop runs longer than an hour and a half, consider adding a short snack break at the half-way point. Provide additional activity ideas for kids to do at home with their families. This might include interviewing relatives; drawing pictures and telling family stories; creating a scrapbook of old family photos; going on a hunt throughout the house looking for documents; or encouraging the kids to visit a cemetery with their family to learn more about their ancestors. Following these steps and adding your own creativity to the process will ensure a successful youth workshop. So what are you waiting for? Get started!